Recently, the Clean Force team were the lucky recipients of fundraising efforts by a team of workers from the NEPA Level Crossing Removal Authority. Undertaking the gruelling Coast to Coast race in New Zealand, the team raised over $10,000 to contribute to training and equipment purchase for Clean Force Victoria. 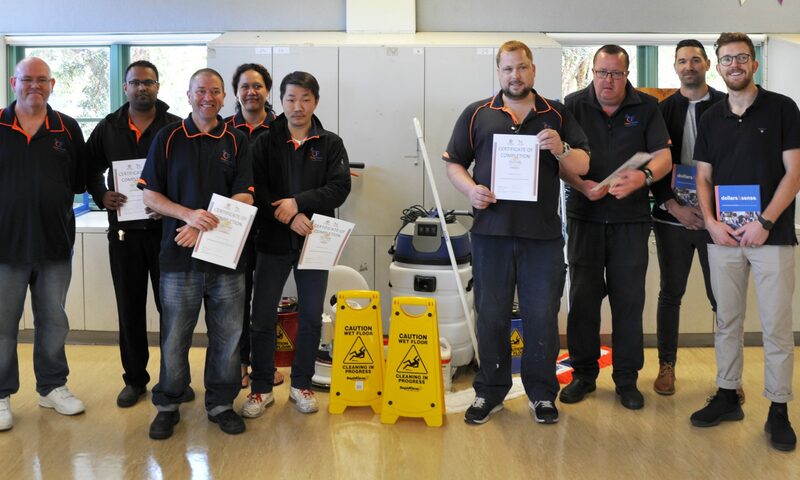 The training, run by Brotherhood of St Laurence, has allowed ten Clean Force employees to develop skills in maintaining and replacing hard floor finishes. Not only has this training provided valuable skills and development to the team members, but it also opens up the capacity of Clean Force to take on jobs with this specialist service and generate further employment opportunities for their employees. The money raised also contributed to the purchase of a two-speed floor scrubber/polisher and a commercial wet and dry vacuum allowing the team to put to use their newly developed skills! Clean Force would like to say a huge thank you to Sam Donaldson (Laing O’Rourke), Leons Ansen and Mark Lawson (Fulton Hogan) and Gearoid Considine who completed the race and raised the funds; Stacey Palmer (NEPA); the City of Darebin for providing the space for practical training; Brotherhood of St Laurence for training; and Agar Cleaning Systems for their generous donation of cleaning chemicals and floor polish.